Holiday.gr - Tsardakia, a trip to a myth! 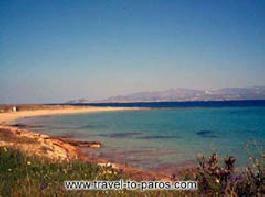 Nea Chrisi Akti (Tsardakia or Tserdakia) is one of the most popular beaches in Paros. It is located 20km from Parikia. It's an extended beach and considered ideal among others in Mediterranean Sea for windsurfing. That's why in the last 7 years, it hosts the World Championship of Wind Surfing, in August. The beach has exceptional facilities. Apart from the experienced surfers, it provides the chance to explore water sports by trained teachers in the beach. Rent the appropriate equipment and conquer Aegean Sea. Been to Tsardakia ? Share your experiences!